I don't mean to bore you, but Pat and I had some interesting experiences with fellow Rotarians in Utah that some of you may find interesting. Pat and I had flown to Salt Lake City on 9-14 to watch the Badgers play BYU in Provo on 9-16. We won 40 to 6 and enjoyed celebrating after with .fellow Badgers. There was to be a Salt Lake City Rotary Club meeting at our hotel at noon on 9-19 that we wanted to attend, but learned on 9-18 that it was replaced with a bunch of evening dinners at several members homes. We did learn that the Club had an office a block and a half from our hotel and so decided to visit it on 9-19 in hopes of a banner exchange. 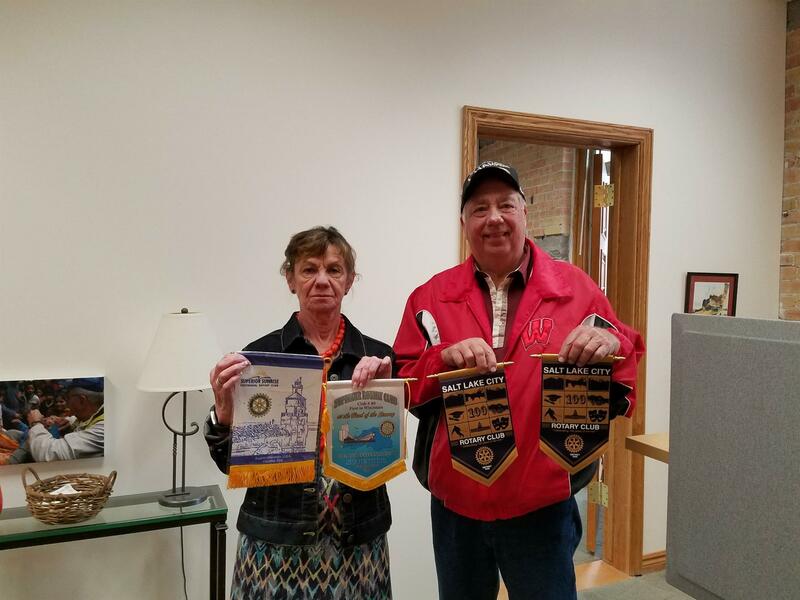 The Office Manager, Linda Kruse, did exchange banners with us but was very proactive in arranging for us to attend dinner that night at one of the Rotarians home along with Rotarian transportation to and from the dinner. Since I'm not a social butterfly and Pat wanted to spend the evening at our hotel because we were flying out the following day, we both tried wrangling out of the invitation to no avail. After the great dinner, the hostess requested all of us to relate a story about ourselves to better get to know one another. Being an introvert, I was mortified. Pat related a story of how she lost our granddaughter in a local hospital when she got whisked away in an elevator and I told how I wrestled a black bear and won. After the story telling, we were returned to our hotel at a decent hour and the evening had turned out fine. Incidentally, the SLC Club has suffered membership loss like us in recent years and they are now down to about 250. 1. While sitting in the MSP airport, a Provo resident came and sat with us and mentioned he too was attending the game. 2. While walking to the stadium, another Provo resident walked with us, carrying on a nice conversation. 3. At our gate in SLC on the way home, one of our flight attendants lit up when she saw our clothing and mentioned she had graduated from UW. A fellow behind us piped up and said he graduated from there 30 years ago. I replied it has been 51 years for me. 4. While heading for our seat, another flight attendant mentioned she was a Gopher fan but has enjoyed fraternizing with Badger fans. She noticed my "Rotary Guatemala" hat and said it didn't match my outfit. I replied my Badger hat was in my carry on bag and Pat replied "along with his Packer hat". 5. While seated, a lady from La Crosse passed by and invited us to attend a meeting of the La Crosse Rotary Club at the Radisson Center on Thursdays at noon and she would pay for our meals. We said we would do it some day, but pay our way. This country is full of some pretty good people.